Sasha’s school recently had a bake sale, and if you know me, you’d know that this is right up my alley. I love to bake, and I love to bake for others. The bonus is that all the money earned from the sale goes directly back to the school. No middle man taking his cut first. 1) Cute individual cupcakes sold way better than my pretty boxed cupcakes. 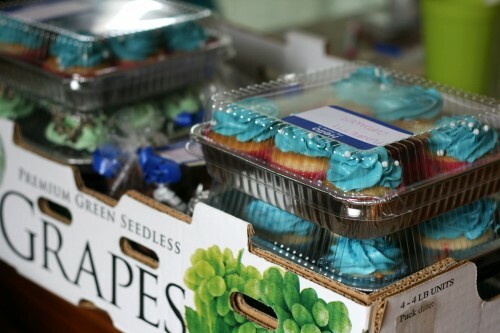 Plus more money was earned selling the cupcake per each instead or per half dozen. We (accidentally or thoughtlessly) placed these cute Minion cupcakes right on a high traffic corner and they were gone almost instantly. 2) Location matters. Next time I will pay attention and place the items accordingly on the tables. 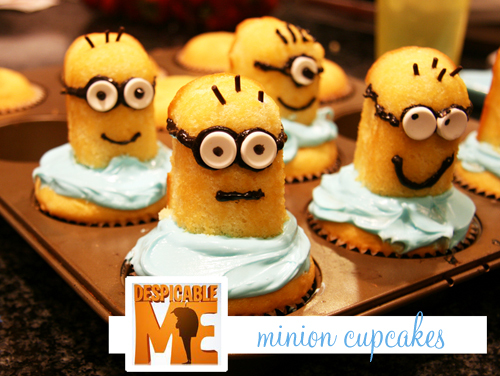 It seemed like whatever was placed in that high traffic corner where the Minion cupcakes were, moved very quickly. 3) As far as cookies go BIGGER was better. I made some giant chocolate chip cookies which were packaged in threes. They sold way faster than the regular sized chocolate peanut butter chip cookies packaged in six, even though the giant cookies were more expensive. 4) Pricing is TOUGH! Since this was a fundraiser I assumed people would be willing to pay a little more for items. Even though our prices were much cheaper than the grocery store or a bakery, items didn’t more as quickly as I would have liked to see. 5) Offer or cheaply sell coffee. A few older patrons asked if we had any, we didn’t. We only had water and soda. Maybe selling coffee and juice would be a good idea for next time. 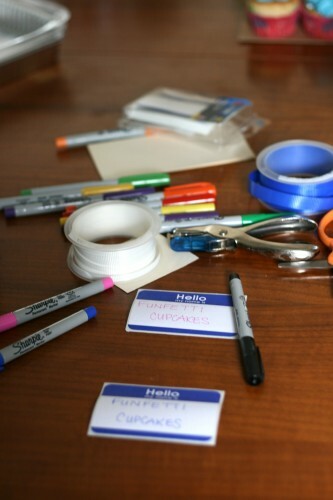 6) Make sure to LABEL everything. Especially if it contains any nuts. Group the nut free items together, this will save those with allergies time when they come up to your table. These are a few of the lessons I learned. I hope there is another bake sale in the Spring so I can put some of these lessons into action. Our bake sale didn’t have a huge variety of items unfortunately. We had a few different brownies, many many chocolate chip cookies, snicker doodle cookies, rainbow colored sugar cookies, a variety of cupcakes, banana bread (a quick seller), walnut/toffee bars, and chocolate cover strawberries (gone almost instantly). I know that we “eat” with our eyes first. So I tried to make my cupcakes look especially nice. I also used ribbons in the school’s colors to decorate all the cookie packages. 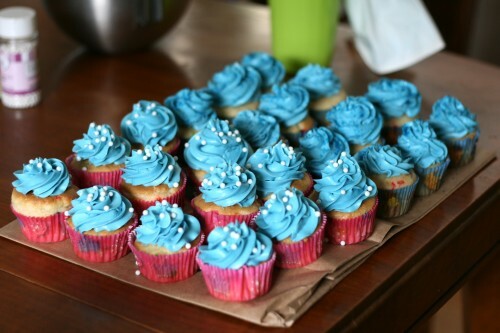 Funfetti Cupcakes with buttercream frosting dyed with AmeriColor gel Royal Blue, decorated with CK Products sugar pearls. 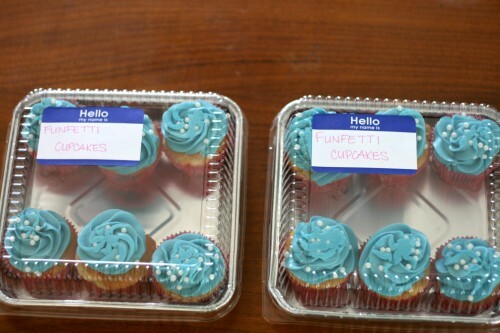 Package and label your cupcakes. I could not for the life of me find disposable cupcake pans. Do they make these anymore? 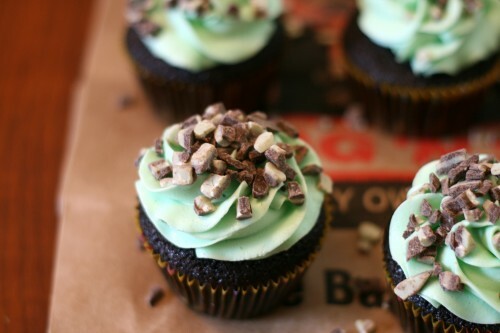 Gluten Free Chocolate cupcakes (Betty Crocker) with Mint Buttercream and Andes Mint baking chips. OMG! When making the chocolate cupcakes I used strong coffee in place of the water. I used the same buttercream recipe as posted, but instead of the vanilla I used peppermint extract. I dyed the buttercream a very light green by using just a tiny drop of AmeriColor gel in Leaf Green. 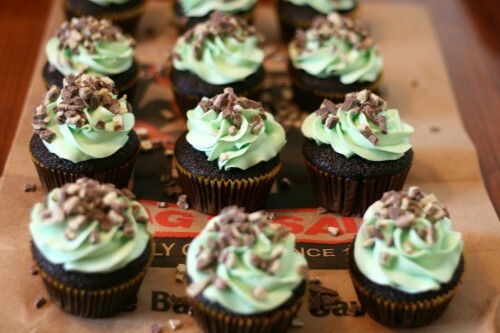 Have you ever helped run a bake sale? Please share any words of wisdom in the comments below! In your mixing bowl cream together the sugar and butter on low until well blended. Beat on medium/medium high for 3-5 minutes until the buttercream looks light and fluffy. Turn down to medium low and add both the vanilla and cream. Beat for a few more minutes. If you need your buttercream to be thinner so it will pipe easier, beat in tiny amounts of cream until you reached your desired consistency. Add in small amounts of food dye if you want to change the color. Remember that your frosting will darken the longer it sits. I used a 1M decorating tip from Wilton. I’m just going to higher you in about 6 years for all my bakesale needs! These all look amazing, I think I’ll be trying out the Andes Mint cookies for the holidays! Thanks for the feature! 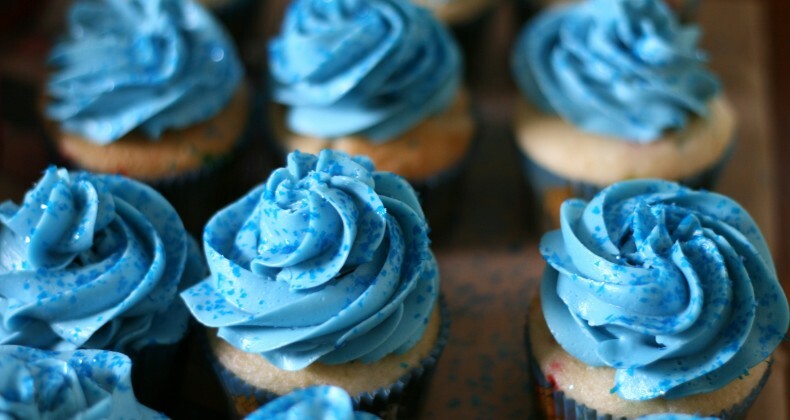 You’ve got some awesome bake sale ideas here! 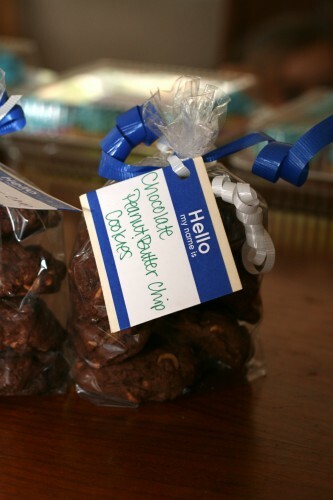 I actually hadn’t thought about doing these for a bake sale but sounds like they were a hot item. The Andes Mint ones sound amazing too! I love that idea Debbie! I shared a popcorn ball recipe last fall but think I will do it your way and share it again. Hi Jamie just a note I add a couple of bags of microwave popcorn to my air popped pop corn (like movie theatre) to give it a little more salt a extra buttery flavor.